Why would fuses #4 and #8 be jumped? - Turbo Dodge Forums : Turbo Dodge Forum for Turbo Mopars, Shelbys, Dodge Daytona, Dodge SRT-4, Chrysler PT Cruiser, Omni and more! Turbo Dodge Forums : Turbo Dodge Forum for Turbo Mopars, Shelbys, Dodge Daytona, Dodge SRT-4, Chrysler PT Cruiser, Omni and more! > Turbo Dodge Technical Chat > Electrical > Why would fuses #4 and #8 be jumped? Why would fuses #4 and #8 be jumped? I continue to solve gremlins in my 85 Omni GLH and I'm getting exhausted. Little maintenance was done to the car so every time I turn around I seem to bump into another issue. Anyhow, enough venting... so my fuse box had 4 jumpers between circuits that I was able to troubleshoot down to just one final problem. #4 and #8 are jumped (heater blower motor to fog lights). When the jumper is in place my car will crank and start and works fine. Also, the headlamps turn on when key is turned on. When the jumper is removed the car will not crank and the headlamps are off. The headlamps switch also doesn't work at turning the headlamps on or off they are just always on. However, the headlamp switch does actually work the park lights when the jumper is in place but doesn't at all when jumper out. The fog lights are both broken so don't work either although they are hooked up on the little switch under the dash. I am not an electrical person so this has been a challenge figuring this out. I suspect that power is being back fed through the circuit by the jumper but would like to resolve this properly. Anyhow, any ideas appreciated as I'm not sure where to look next. I do have all the service manuals to refer to and welcome any help or guidance. I've attached a picture so you can what it looked like when I first started working on the fuse box. Last edited by Swandog; 04-16-2019 at 12:13 AM. Re: Why would fuses #4 and #8 be jumped? one of the +power feeds to the fuse box I would assume is no longer working. check the fusible links under the hood. I would remove all of those jumpers. get a multi meter check for 12Volts + on the fuses with the ignition on. each row of fuses is connected to the same "power rail"
each rail is connected to the battery some always on some with the ignition. just before the battery are the fusible links. if the link are blow the wire is like a elastic band. it'll stretch. I can't post a link with good information, but if you google. "minimopar and fusible links" it'll have what you need. The fuse block receives power from both a fusible link and the ignition switch. 1)Remove the jumpers and replace them with the proper size fuse. 2)Turn the key to the "on" position and turn the headlamps on. 3)Use a 12 volt test lamp or DVOM to check each fuse for power in and power out. 4)Post back with your results as to which fuses DID NOT have power IN and we will go from there. Thanks everyone for your replies. I won't get time to work on the car until tomorrow but will post results. Thanks again! 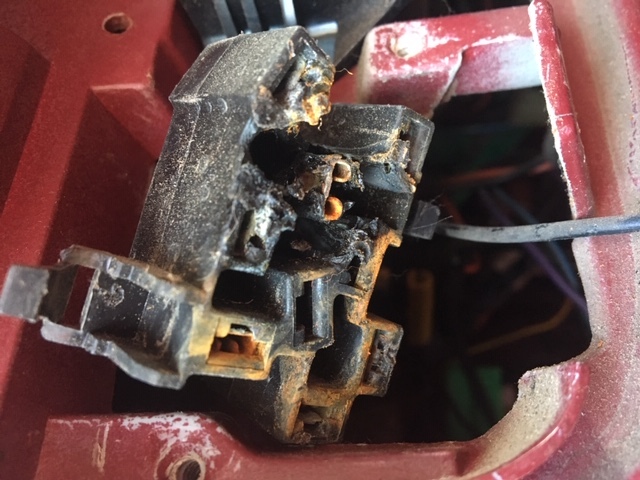 I was able to remove the "jumper" today when I found that the back-up lights were disconnected and the ground was not attached. Once I put these in place and pulled the jumper the car started just fine. 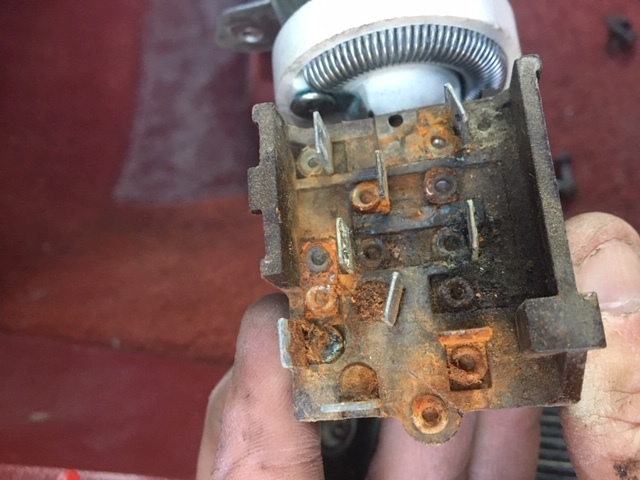 I pulled the headlight switch out and found that the connector was melted (see pic) but the headlight switch is still functioning (although always on after ignition running). I can live with that until I find a spare connector and switch. So last electrical gremlins are no backup lights and likely a headlamps switch. No power to the fog lamps either but I believe it comes through the dimmer switch area so will fix the switch and connector first. The backup lamps are easy to diagnose. 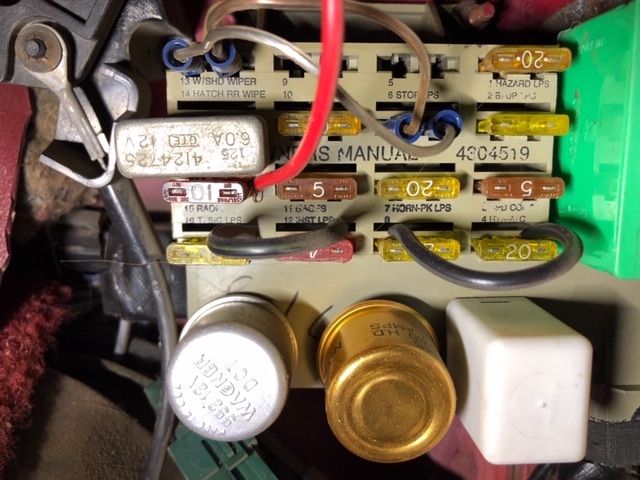 Locate the backup lamp switch (manual trans) or neutral safety switch (auto trans) on the transaxle, remove the connector, jump the two wires for the backup lamps WT and VIO/BK or BK/VIO) and turn the key on. If they illuminate the switch is faulty, if they do not illuminate check for power to the switch. Power comes from fuse #2. Fuse #2 receives power from the ignition switch.